(Clockwise LtoR): Lari Cowgill, Joanne Maki, Mark King, Jeff Rapp, and Martha DeHart. Photo by Owen Ogletree. 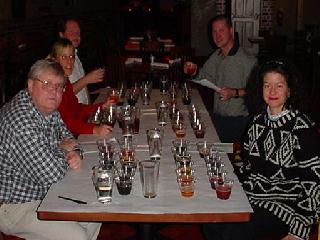 Owen Ogletree (director of Brewtopia Events) gathered together some of his devoted beer loving friends in February of 2002 at the Athens Steam Company Pub to sample and comment on several mixed styles of ales and lagers that are strong in flavor and/or alcohol content. This beer sampling was done as a blind tasting where no one was aware of the brands that were being served. Beers were informally commented upon and ranked according to American Homebrewers Association (AHA) style guidelines. First, second, third places, and honorable mention were awarded to the beers we felt represented their individual styles in extraordinary fashion. Drop Owen an email to share your comments and opinions. Opened in late 2001, Athens Steam Company Pub is part of the Foundry Park Inn and Spa complex near the Classic Center (site of our annual Classic City Brew Fest). See our Athens beer page for more details on this pub. 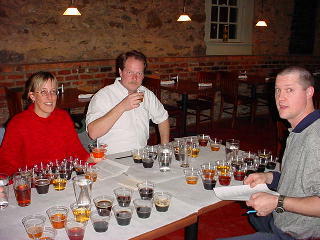 The photo to the right shows Joanne, Mark, and Jeff anxious to dive into our 12 beers included in this tasting. Aroma: Big hop aroma of American citrus/resin-like hops. A hint of toasted malt and a nice fruity presence are also in the aroma. Appearance: Deep copper in color -- very attractive with nice head retention. Flavor: Hop flavor and bitterness are wonderful, not astringent. Smooth malt and hops make a wonderful combination. Medium-bodied with a great mouthfeel. Has a perfect hint of malt sweetness to match the dryness of the hops. If you like hops, you'll love this delicious ale. Aroma: Nice hardwood smoke, hints of chocolate, great balance. Appearance: Dark black, opaque, beautiful. Flavor: Malt, mild smoke, chocolate, wonderful balance, rich and full, pleasant, not overwhelmingly smoky. Nice medium/full mouthfeel. This is an awesome brew. Aroma: Fruity, candied fruit, toffee, plum, currant, and raisins. Appearance: Dark amber with ruby highlights and low carbonation. Flavor: Fruity with nice, rich malt. Full mouthfeel, not very bitter for style, toffee/sweetness is strong, could have more American hops for balance. Flavor is good -- not cloying. This is a delicious, warming, powerful ale. Aroma: Roasted grains prominent. Some fruitiness. Appearance: Deep, attractive black color, low carbonation. Flavor: Roasted grain obvious, hop bitterness medium, thick mouthfeel -- a thick, roasty, flavorful beer. Aroma: Honey-like with floral, citrus, alcohol, fruity notes. Quite complex. Appearance: Very gold and clear. Still (no carbonation). Flavor: Lots of mouthfeel and warming alcohol. Honey with brandy/port notes, fruity, sweet, nice body, smooth texture, not astringent. This would be a nice, warming, after dinner drink. Aroma: Spicy, musty, tart, earthy. Appearance: Golden with bright white foam. Flavor: Bitterness is high, high carbonation bites the tongue, asprin/metallic-like, hops predominate, light/medium mouthfeel finishes a bit dry. A very interesting ale similar to Orval Trappist Ale. Aroma: Caramel notes, apple-like, winey. Appearance: Deep gold in color with good clarity. Flavor: Spice, clove, thick/soft mouthfeel, light toffee notes? Needs more of a dry finish. Mouthfeel is full. A good, complex ale. Aroma: Light aroma of ripe fruit, malt, and no hops. Appearance: Light brown in color, cloudy. Flavor: Salty, mineral-like, raisins, wheat, a hint of clove -- mild flavors for style. A hint of oxidation (sherry) character is present and good for style. No hop flavor or bitterness. A bit weak for style, but very pleasant. Aroma: Malty with hints of roast. Clean with no fruity esters. Appearance: Dark ruby in color, pretty. Flavor: A nice chocolate flavor with a hint of bitterness. Clean and smooth -- very drinkable. Not very rich -- a bit dry for style -- needs a bit more residual sweetness. Aroma: Fruit, malt, licorice, allspice -- nice, balanced aroma. Flavor: Medium/full body, rich, ginger, nutmeg, pleasant, dark malt is flavorful (not astringent). Could be a bit richer in spice notes. A smooth, flavorful beer with character. Aroma: Black currant, fruity aroma with no butterscotch character. Appearance: Black color -- garnet-like. Flavor: Needs more coffee-like notes. Mouthfeel is medium. Not very complex. A rich, fruity ale with subtle notes of dark malt. Aroma: Licorice, dark fruit notes. Roastiness is restrained. Appearance: Large head, huge carbonation, reddish-black in color. Flavor: Suggestion of cocoa, very full-bodied and rich. Hints of minor plastic, band-aid, clove (slightly infected perhaps?). A flavorful, thick beer with minor problems.